Our beautiful California weather sure is hard on patio furniture. 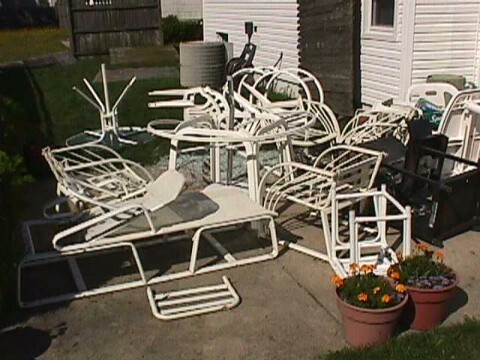 We pick up and remove at least one weather worn patio furniture set every day. We often can recycle patio furniture especially if it’s plastic or metal. Sometimes we find a new home for gently worn patio furniture – My patio furniture is right off my truck and into my back yard and it’s beautiful. Heck, so is my BBQ grill! A broken patio set that needs to removed and transported to a scrap metal yard.